Freyr is the god of fertility and fruitfulness. He is the noblest of the gods. Together with his sister, Freyja, he brings peace and prosperity to men and the blessings of fertility to the home and the field. The Norsemen made sacrifices to Freyr til árs ok friðar (for frutifulness and peace). Freyr is the son of Njorð by Njorð's own sister. He is of the race of the Vanir. At the end of the war between the Æsir (the Warrior gods) and the Vanir (the Fertility gods), hostages were exchanged. 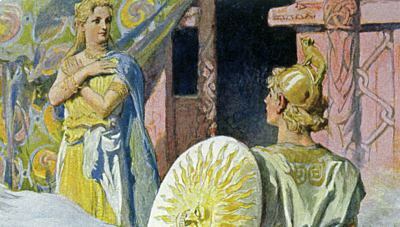 Freyr, with his father and sister Freyja, came to Ásgarð, the home of the Æsir. Freyr posses two great treasures made by dwarves: the boar Gullin-börsti with golden bristles, and the ship Skíðblaðnir, which is large enough to hold all the gods, but which can be folded small enough to fit in one's pouch. The story of how Freyr wooed his bride is told in the poem Skírnismál. One day, Freyr sat in Óðin's chair Hliðskjálf, from where one can look out and see all the worlds. Freyr spied Gerð, the daughter of a giant, and was consumed with desire to wed Gerð. 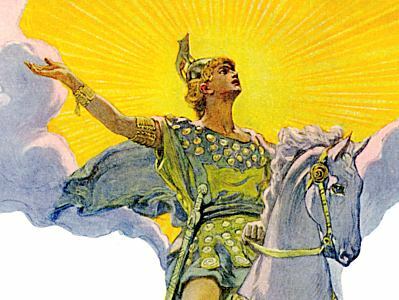 Skírnir rode Freyr's horse through the curtain of fire surrounding Gymir's hall. The entrance to the hall was guarded by ferocious hounds. On a grave mound nearby sat a herdsman. Skírnir asked him how he might gain entrance to the hall. The herdsman replied, "Are you doomed to die? Or are you dead already? There is no way in which you can talk to Gymir's daughter, now or ever." Skírnir responded, "Those choices are better than just sobbing about it. The day of my death was fated long ago." Hearing the commotion outside the hall, Gerð asked the servants to invite the visitor in for a horn of mead. Once inside, Skírnir began to advance Freyr's marriage proposal, presenting Gerð with the golden apples and other tokens of Freyr's wealth. She was uninterested. "No one is going to buy my love." Skírnir resorted to intimidation, threatening to behead her with Freyr's sword, but still she was unmoved. "No coercion will make me change my mind." Finally, Skírnir resorted to magic, with a torrent of terrifying threats, saying "I forbid this woman pleasure from any man. You'll live always amongst three-headed giants and never once sleep with a husband. Hrimgrimnir is the giant that will enjoy you in the gloom near Hel's gates. Foul corpses will give you only goat's piss to drink. That is the best drink there will be for you. That is my curse." Gerð at last gave in, saying, "I never believed that I should swear love to one of the Vanir." She consented to the marriage and agreed to meet Freyr in a forest clearing nine nights hence. Skírnir, taking his leave, returned to Ásgarð. Freyr stood waiting to greet him. Skírnir told him the good news. But Freyr despaired. "One night is long. Two nights are longer. How can I bear three? A whole month is shorter than even half of such a pre-marital night." 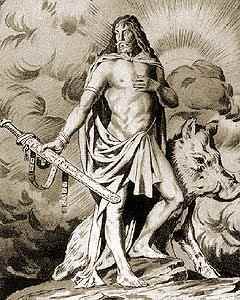 The loss of Freyr's sword will be keenly felt at Ragnarök; Freyr will be killed with a single stroke from Surtr, the flame giant.